We’d love your help. Let us know what’s wrong with this preview of Her Billionaire in Hiding by Sophia Summers. When the press start marketing Coop as single and available after the death of his first wife, it seems the only way to hide from the paparazzi of his country is to find some obscure town in Texas. Jessie turns down a sketchy music production deal and loses her chance to tour the country. When her reputation is being defamed worse every day, she turns to the quiet dude ran When the press start marketing Coop as single and available after the death of his first wife, it seems the only way to hide from the paparazzi of his country is to find some obscure town in Texas. Jessie turns down a sketchy music production deal and loses her chance to tour the country. When her reputation is being defamed worse every day, she turns to the quiet dude ranch in Texas. When Coop and Jessie find in each other what they have always been missing, will it come at the cost of the reasons they hide? To ask other readers questions about Her Billionaire in Hiding, please sign up. Will we ever learn how she song to him and what happen to the agent and producer ? Man, talk about hitting the ground running. This is simply one beautifully sweet tale that captivates and captures your heart from the start. The instant attraction and connection between the two main characters as they strive to put space between them and unwanted attention. This is a fast paced, pulse racing, heart pounding, page turning tender read that have realistic and believable characters. The characters are written with such realism it really pulls this bad boy toge ONE BEAUTIFUL READ!!! A sweet fantastic story that is a well written. The characters are realistic and believable in this fast paced page turner. Jessie and Coop are celebrities that both have passed burned issues needing to lay low. They have a strong connection and attraction in a breif meeting at a bus stop but when fate brings them together at a ranch that is a hideaway for people who just need privacy for awhile your on the edge of your seat for a HEA. I voluntarily reviewed this ARC. Can love survive the paparazzi? Sweet, clean romance. Great fun read! Chase, a sweet Australian Shepherd, brought Jessie and Coop together by chance at a bus station. I really enjoyed reading their journey to find love and happiness after the paparazzi ruined their lives. The heartwarming characters are warm, funny and believable. Great storyline with some interesting twists and a HEA! Enjoy! Love at first sight! This is a beautiful story about two people who meet by chance and are immediately drawn to each other. When they meet again they agree it was love at first sight. Jessie and Cooper are both wonderful people who have been wronged by the media and are hiding out. Their relationship was very sweet and progressed quickly. I enjoyed the story, but felt the epilogue was rushed and more a statement of facts than the flow of a story. Otherwise, it was a nice read. The paparazzi world is a cruel one and entertainment industry has many underhanded, less than honorable people in it. Jessie and Coop havw both been victims of this treachery and hiding away from the press. A chance encounter, brought about by Coop's dog Chase, lasting only a minute or so leads both to feelings of "love at first sight" for both. Although there a couple missteps along the way, there is an HEA! Billionaire in Hiding is a clean romance of the highest caliber! It is the story of Cooper and Jessie who share a chance meeting at a bus depot and again when they are both guests on an exclusive ranch hiding from the paparazzi, for different reasons. The author writes well and the plot is centered around great characters she has created. A wonderful, feel-good book. 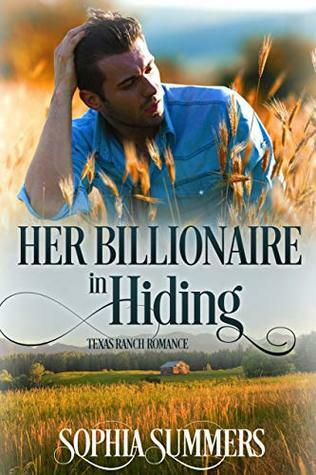 A rich widow goes into hiding in small town Texas ranch. He meets a musician who lost her chance at touring due to a sketchy deal. They fall for each other despite themselves. Will they be able to commit to each other? A sweet quick romance read. This was a fun romance to read. I loved the TExas ranch that lets people get away from the public and be a little anonymous. This is a sweet, clean romance. Loved this story! They are both vulnerable when they see each other the first time and have no idea they will meet again. This is a outstanding and honest look at love and understanding of the mix emotions and heartwarming romance story with their love and forgiveness. Not bad at all. Cute, sweet, and somewhat unrealistic it's the perfect escapist read. I enjoyed it and the sample at the end of another one of her books makes me want to read the rest of her works. She writes historical romance under a different name. The Billionaire Royals is her first contemporary romance series.